می­دانند. به گزارش پژوهشها و مشاهده­های میدانی، افت تحصیلی و گاه انصراف دانشجویان از رشتة مهندسی ریشه در درس ریاضی دارد. هدف پژوهش حاضر در گام اول، شناسایی مهم‌ترین درس پیش­بینی­کنندة عملکرد تحصیلی دانشجویان مهندسی از بین دروس ریاضی (1)، ریاضی (2) معادلات دیفرانسیل و ریاضی مهندسی است. در گام دوم، شناسایی نقش باورهای معرفت‌شناسی ریاضی در پیش‌بینی مهم‌ترین درسی است که در گام اول شناسایی ‌شده است. پژوهش حاضر از نظر روش توصیفی ـ همبستگی بود. جامعة آماری تمامی‏ دانشجویان کارشناسی دانشگاه صنعتی بیرجند بودند؛ دانشجویان در سال تحصیلی94 ـ 95 بالا­تر از ترم شش تحصیلی بودند و رشتة­ آنها برق، رایانه، صنایع و عمران بود. تعداد آنها 550 نفر برآورد شده است که با استفاده از روش نمونه­گیری خوشه­ای تعداد 225 نفر به­عنوان نمونه انتخاب شدند. تحلیل رگرسیون نشان داد دروس ریاضی 7/32 درصد از تغییرات معدل کل دانشجو را پیش­بینی می­کند و درس ریاضی (1) مهم‌ترین پیش­بینی­کننده است. نتایج تحلیل رگرسیون نشان داد باور معرفت‌شناسی ریاضی، 1/8 درصد از تغییرات نمرة دانشجویان را در درس ریاضی1 پیش­بینی می­کند. منبع دانش، سرعت کسب دانش و قابلیت ذاتی سه مؤلفة مهم برای پیش­بینی موفقیت دانشجویان مهندسی در درس ریاضی (1) هستند. این یافته­ها بحث و پیشنهادهایی برای افزایش کیفیت و احتمال موفقیت دانشجویان مهندسی در دروس ریاضی ارائه ‌شده است. Some believe the mathematics as the highway to engineering; some others believe mathematics as a goalkeeper for entering the talented people to the engineering world. According to researches and observations, math is an important factor in engineer’s dropout. At first step the aim of this research is to find which one of math courses including calculus 1, calculus 2, differential equations and engineering mathematics is the main predictor of academic performance of engineering students. Another aim is to find the role of math epistemological beliefs in beliefs students’ performance at the main course which identify at first phase. Descriptive correlational method is used to achieve research goals. The research statistical population was all senior undergraduate students, of Industrial University of Birjand in the 2015-2016 who educate in the fields of electric, computer, civil and industrial engineering. They were estimated to be 550 students who 225 students were selected among them using cluster sampling method. Regression analysis showed that 32.7 percent of the variance of students’ GPA explained by these math course and calculus 1 is the most important predictor. Regression analysis showed math Epistemological belief explains that 8.1 percent of the variation of student`s score is anticipated by in math 1. Source of knowledge, speed of knowledge acquisition and innate ability are three components which are important for anticipating the success of engineering students in a math 1. These findings are discussed and suggestions is proposed to enhance the quality and success probability of engineering students in calculus. 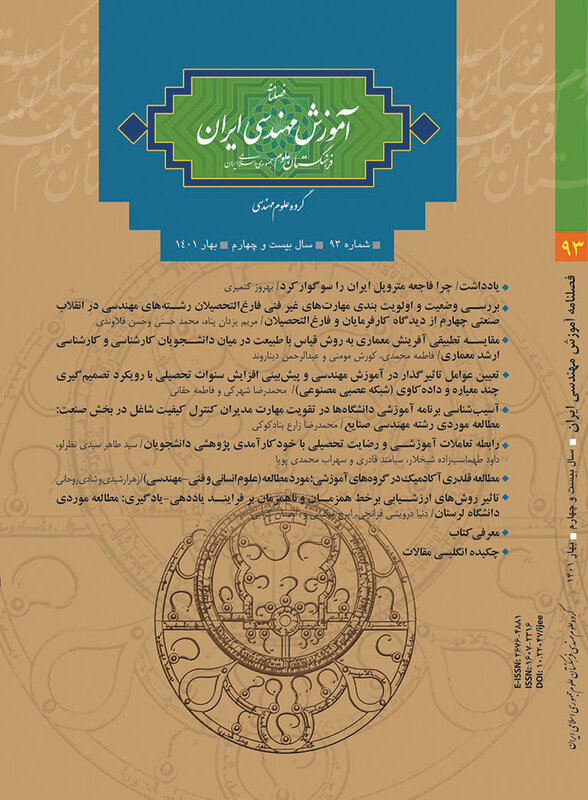 ابراهیم کافوری، کیمیا؛ ملکی، حسن و خسروبابادی، علی اکبر(1393). بررسی نقش عناصر برنامه درسی کلاین در افت تحصیلی درس ریاضی سال اول دوره متوسطه از دیدگاه شرکای برنامه درسی. فصلنامه پژوهش در برنامه ریزی درسی، 2(17)، 62 ـ 50. امینی، محمد و رحیمی، حمید (1395). بررسی سبک­ها و شیوه‌های یادگیری دانشجویان دانشکده مهندسی دانشگاه کاشان. فصلنامه آموزش مهندسی ایران، 18(69)، 53-39. رستگار، احمد؛ قربان جهرمی، رضا، غلامعلی لواسانی؛ مسعود و نیکبخت، مریم (1394). رابطه باورهای معرفت‏شناختی و پیشرفت تحصیلی ریاضی: نقش واسطه‌ای اهداف پیشرفت، خودکارآمدی ریاضی و درگیری شناختی. چهارمین همایش ملی و سومین همایش بین المللی مهارت آموزی و اشتغال. تهران، سازمان آموزش فنی و حرفه­ای کشور. شعبانی­ ورکی، بختیار و حسینقلی‏زاده، رضوان (1386). تحول باورهای معرفت‏شناختی دانشجویان. دوماهنامه علمیـپژوهشی دانشور رفتار دانشگاه شاهد، 24(14)، 23-38. علیزاده گرجی، خورشید (1389). رابطه‏ یافت تحصیلی با افت ریاضی مدرسه‏ای. یازدهمین کنفرانس آموزش ریاضی ایران، ساری 27 الی 30 تیر ماه. کدیور، پروین؛ تنها، زهرا و عرب‏زاده، مهدی (1389). بررسی ساختار عاملی و اعتباریابی مقیاس باورهای معرفت‏شناختی ریاضی. فصلنامه اندازه‏گیری تربیتی، 4(1)،73-88. کدیور، پروین؛ تنها، زهرا و فرزاد، ولی‏اله (1391). رابطه باورهای معرفت‏شناسی، رویکردهای یادگیری و تفکر تأملی با پیشرفت تحصیلی. مجله روانشناسی، 3(16)،251-265. نیلی، محمدرضا؛ مقتدایی، لیلا؛ نظری، حسین و موسوی، ستاره (1395). بررسی نگرش­های دانش‌آموختگان فنیـ مهندسی دانشگاه اصفهان در راستای کیفیت برنامه‌های درسی تجربه‌شده. فصلنامه آموزش مهندسی ایران، 18( 69)، 76-55. مختاری، حیدر؛ داورپناه، محمدرضا و آهنچیان، محمدرضا(1392). باورهای معرفتی دانشجویان و تأثیر تغییرهای زمینه‏ای بر آن. فصلنامه پژوهش و برنامه‏ریزی در آموزش عالی،2(19)،1-22. مهدیان، حسین؛ اسدزاده، حسن و قدسی، احقر(1389). استانداردسازی پرسش­نامه آموزش ترغیبی و بررسی رابطه آن با باورهای هوشی و عملکرد تحصیلی دانش‏آموزان دوره متوسطه شهر کاشمر، 1(1)،1-30. یارمحمدی، مسیب؛ مقامی، حمیدرضا (1389). بررسی عامل­های مؤثر بر افت تحصیلی درس ریاضی دوره متوسطه (منطقه سردرود). مجله علوم تربیتی دانشگاه شهید چمران اهواز، 17(1)، 27-44. Cardella, M. (2007). What your engineering students might be learning from their mathematics pre-reqs. (Beyond integrals and derivatives). ASEE/ IEEE Frontiers in Education Conference, Milwaukee, Wisconsin, S4F1-S4F6. Chen, X. and Soldner, M. (2013). STEM Attrition: college students’ paths into and out of STEM fields. National Center for Education Statistics, U.S. Department of Education, November. Conley, A. and Venire, L. (2004). Changes in epistemological beliefs in eleminetary science students. Contemporary Educational Psychology, Elsevier, 29.20. Croft, T. and Grove M. (2006). Mathematics support: Support for the specialistathe matician and the more able student, MSOR Connections, 6(2), 1 -5. Cuthbert, R. and MacGillivray, H. (2003). Investigating weaknesses in the underpinning mathematical confidence of first year engineering students. Proceedings of the 14th Annual Conference for Australasian Association for Engineering Education and 9th Australasian Women in Engineering Forum. Goold, E. and Devitt, F. (2012). Engineers and mathematics: The role of mathematics in engineering practice and in the formation of engineers. Saarbrücken, Germany: Lambert Academic Publishing. Kizilgunes, B.; Tekkaya, C. and Sungur, S.(2009). Modeling the relations among student’sepistemological beliefs, motivation, learning approach, and achievement. The Journa of Educational Research, 243 – 255. Kennel, B. L. (1994). The relationship between parenting style and epistemological beliefs, Educational Psychology, 113, 215 –228. King, P. M. and Kitchener, K. S. (2004). Reflective judgment: theory and research on development of epistemic assumptions through adulthood. Educational Psychologist, 39, 5-18. King, R. (2008), Addressing the supply and quality of engineering graduates for the new century, University of Sydney, Sydney. Klein, P. D. (2005). Epistemology. In Craig, E. (Ed.). The shorter Routledge encyclopedia of philosophy. Rout ledge, London, 224-227. Kloosterman, P. and Stage, F. K. (1992). Measuuring beliefs about mathematical problem solving. School Science and Mathematics, 92(3), 109-115. Kloosterman, P. and Stage, F. K. (1998). Self–confidence and motivation in mathematics. Journal of Educational Psychology, 80, 345-351. Meyer, M. and Marx, S. (2014). Engineering dropouts: a qualitative examination of why undergraduates leave engineering. Journal of Engineering Education, 103(4), 525-548. Mooney, O.; Patterson, V.; O'connor, M. and Chantler, A. (2010). A study of progression in Irish higher education. Dublin: Higher Education Authority. Schommer, M. (1990). Effects of beliefs about the nature of knowledge oncomprehension. Journal of Educational Psychology, 82, 498-504. Schommer, M. (1993). Epistemological development and academic performance amongsecondary students. Journal of Educational Psychology, 85, 406-411. Schommer-Aikins, M.; Duell, O. K. and Hutter, R. (2005). Epistemological beliefs, mathematical problem-solving beliefs, and academic performance of middle school students. The Elementary School Journal, 105, 289-304. Schommer, M. and Walker, K. (1995). Are epistemological beliefs similar acrossdomains? Journal of Educational Psychology, 87, 424-432. Wheeler, D. (2007). Development and construct validation of the epistemological beliefs survey formathematics. Unpublished doctorate thesis, Oklahoma State University, USA. Winkelman, P. (2009). Perceptions of mathematics in engineering, European. Journal of Engineering Education, 34(4), 305-316. Wood, L. N.; Mather G.; Petocz P.; Reid A.; Engelbrecht J.; Harding A.; Houston, K.; Smith, G. H. and Perrett, Gillian(2010). University students' views of the role of mathematics in their future, International Journalof Science and Mathematics Education, 10(1), 99-119.